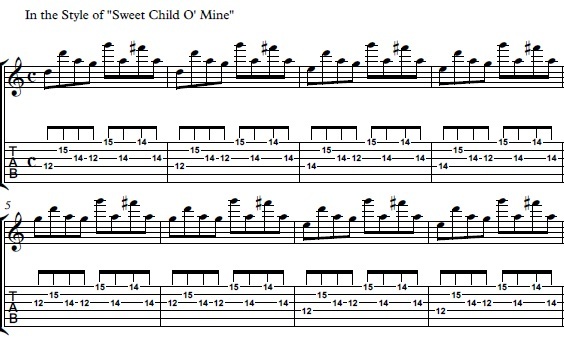 In this Sweet Child O Mine guitar lesson, learn how to play the intro lead parts to this Guns and Roses classic! John is going to give you a quick lesson breaking down this iconic song. This is one of those songs that everyone seems to love and wants to pick up a guitar and play! It’s a super fun one, sounds really complicated but isn’t that bad, and is just definitely an iconic classic song. The story goes that Slash was playing the intro in a rehearsal as a warm up and the band loved it, asking him all about it, when he wrote it, very excited to use it, and he was just looking at it as an exercise he made up! And how glad we are he did and that it has become one of the most played, and most learned intro’s of all time! 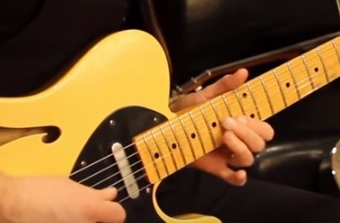 The first thing to notice in this Sweet Child O Mine guitar lesson is the tuning! The guitars for this track are all tuned down one half step on the original recording. So instead of standard tuning where the 6th string is E, the 5th string is A, the 4th is D, the 3rd is G, the 2nd is B, and the 1st is E, we now lower the 6th string to Eb, the 5th to Ab, the 4th is Db, the 3rd is Gb, the 2nd is Bb, and the 1st is Eb. So everything just has a flat added to it. The symbol for flat looks just like a lowercase letter “b”. So to play along with the original recording you must tune your guitar down one half step, however, in today’s lesson John is in standard so feel free to leave your guitar in standard as well. If you are enjoying this iconic riff, be sure to check out our lesson on how to play Hells Bells by AC/DC for another iconic classic rock riff! To start the intro put your first finger on the 12th fret 4th string and pick it once. Then take your third finger and jump it up to the octave on the 14th fret 2nd string. Then put your second finger on the 14th fret of the 3rd string and then on the same string go to the 12th fret 3rd string with your first finger. Then you jump all the way up to the 15th fret on the 1st string using your third finger to hold it down, then back down to the 14th fret 3rd string. Then bring your 3rd finger back to grab the 14th fret 1st string, then back to 14th fret 3rd string with your middle finger. Watch John put that all together at the 1:44 minute mark and play through what we have so far. Then repeat all of that again! And the entire rhythm for this part is eighth notes, so each note picked is an eighth note. That is the first part! John didn’t use his pinky and his picking hard was strictly using downstrokes. So just play that two times. For the next part everything stays the same, except you are going start with a different note. You will start with your ring finger on the 14th fret on the 4th string. Everything else is the same. So you are really just changing that very first note. Play this twice, with the changed root note to start it off, both times. See the video at the 2:36 minute mark to see John play through variation two! For variation three, just move your starting note again. This time we start with our pointer on the 12th fret 3rd string. So again only changing the first note. Everything else stays the same, repeat this twice, with the changed first note both times. Then go back to variation one and play that twice! Follow along with John in the video at the 3:07 mark to see him play the entire intro so far! Every two times through the riff we change the first note. And go ahead and end this riff with an open D chord! I hope you enjoyed this Sweet Child O Mine guitar lesson! What a song and what a riff! Like I was saying before, this is just such a fun song to play. I remember when I first learned it and the look in someone’s face when I teach them of just pure joy. It isn’t too hard but it’s just hard enough where it does feel like quite an accomplishment and it’s just hard to not feel cool playing this riff! So remember to slow it down, pay attention to the details and the slight variations, and of course, as always, have fun!